AWC-SB’s popular summer reading program continues on Friday, August 19 at Eladio’s by the beach. 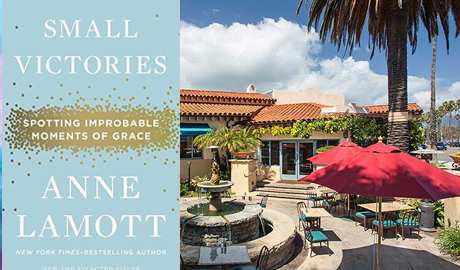 For August our discussion will revolve around Small Victories: Spotting Improbable Moments of Grace by Anne Lamott. Please join us and support this lovely venue by treating yourself to breakfast (Please bring cash). Bestselling author of the iconic Bird by Bird, Anne Lamott writes about faith, family, and community in essays that are both wise and irreverent. It’s an approach that has become her trademark. Now in Small Victories, Lamott offers a new message of hope that celebrates the triumph of light over the darkness in our lives. Our victories over hardship and pain may seem small, she writes, but they change us—our perceptions, our perspectives, and our lives. Lamott writes of forgiveness, restoration, and transformation, how we can turn toward love even in the most hopeless situations, how we find the joy in getting lost and our amazement in finally being found. Profound and hilarious, honest and unexpected, the stories in Small Victories are proof that the human spirit is irrepressible. This entry was posted in Past Events on July 26, 2016 by Lisa.